Please join the Texas Army for Pioneer Day at Jesse Jones Park. The park features a pioneer era village which will be hosting living history demonstrations, interpretations, displays, and interactive activities showcasing pioneer life during the early settler days of Texas (1830’s – 1840’s). There will be a battle between the Mexican Army and the local militia. 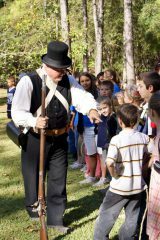 This is a family friendly venue for exploring Texas history and learning about frontier life.